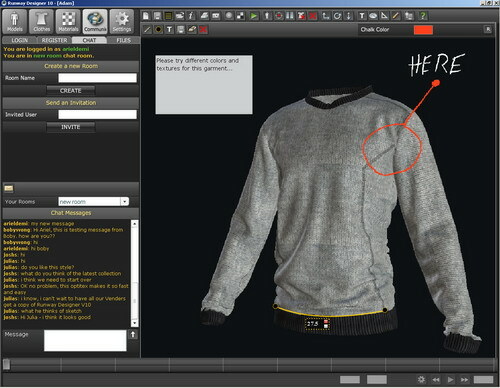 OptiTex, the industry leader in 2D/3D CAD/CAM design technology for cut-fabric related industries, has made its best-of-breed software even better by enhancing one of its core products, 3D Runway Designer 10, with remote collaboration tools. We've integrated several new features into Runway 10 to smooth the collaboration between designers and production professionals, states Ran Machtinger, President and CEO of OptiTex, Ltd. Chief among the improvements is an open chat room, which allows production and image files in 2D and 3D to be sent between partners participating in the design process. They can then easily modify these images using our new chalk tool, allowing design and production staff to draft on-screen together, in real time from remote locations. These new and upgraded features represent another step forward in the OptiTex revolution, allowing virtually all of the design process to be performed digitally. in action on OptiTex's 3D models, all of which are fully adjustable to reflect any body type. OptiTex's on-screen environment is customizable to enhance the designer's creative process. The accuracy of the images eliminates material, energy and time waste, providing rapid ROI as well as an environmentally friendly application. The new, collaborative features in 3D Runway Designer 10 dovetail perfectly with another area in which OptiTex has experienced a surge in growth: Utilization as an essential learning tool in educational settings, ranging from renowned universities to vocational training centers. Screen capture of 3D Runway Designer 10, Sketcher and Communication Tools.